Over the past few weeks I’ve been learning aspects of how to make a coat. As a cutter, that’s not what I will do day to day once I’ve finished my apprenticeship, but it’s a useful way to learn about how the cloth you cut is made into a suit. It has practical implications for how you cut as well. For example, I learnt about how much inlay is ideal to be left inside the seams – around the inside of the armhole for instance. We get feedback from the tailors fairly regularly on what we have cut, what could be improved and what was easy or difficult to work with. But that doesn’t compare to having to do it yourself. I learnt how to do some of this at college, but many parts are new. How the parts of the chest canvas are sewn together, for example, is not something I was ever taught. That took a bit of time to learn. Plus a lot of how an Anderson & Sheppard suit is made is unique and wouldn’t be taught anywhere else. The soft construction, for example, and the way the chest rolls. Sunna has been very helpful and the other tailors have been showing me various steps as well. 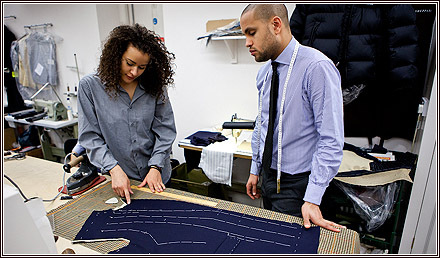 It’s taken a while but by the end of it I will have my own Anderson & Sheppard suit – partly made by me.